Warren Spector: Deus Ex "Is Not Done For Me"
Warren Spector might be going full Mickey these days but in a recent interview he suggested that we could still see some "Deus Ex stories" from him at some point in the future. Spector has made some pretty awesome games over the years, none more so than Deus Ex, his millennial tale of a crumbling near-future Earth which mixed numerous outrageous conspiracy theories with a sluggish, dated game engine, muddy textures, ugly models and absolutely god-awful voice acting, and somehow came up with an explosive bundle of pure, mind-blowing awesomeness as a result. Naturally, fans everywhere were disappointed when he announced in June of last year that he was "tired of making games about guys in black leather carrying guns." It was, by all appearances, the last nail in the coffin. But maybe not. In a recent interview with Variety, ostensibly to talk about Epic Mickey, Spector revealed that he might not be quite as sick of the J.C. Denton set as he'd let on. 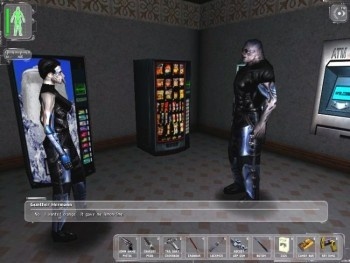 Prior to the sale of Junction Point Studios to Disney, he said he'd approached the company looking for a publisher for two projects he was already working on: "A big, big fantasy game" based on a setting he'd originally created for DC Comics, and a near-future sci-fi title described as a "spiritual successor to Deus Ex in many ways." "There were and still are Deus Ex stories I would like to tell. That story is not done for me," Spector said. "[For the sci-fi game] I sort of filed the serial numbers off. Deus Ex was very much a game of the millennium." The possibility of more Deus Ex isn't just wishful thinking; Spector also said that while his own attempts to secure the rights to the franchise from Eidos were unsuccessful, Disney was able to pick them up when it purchased Junction Point in 2007. Disney Deus Ex, anyone?